Joy Creek Photo Archive (c) all rights reserved We are impressed with the erect habit of Lavandula 'Willow Vale' (1992). The large inflorescences are quite showy with dark purple corollas and red purple inch-long bracts at their tips. The foliage is a complementary gray. Both flowers and foliage have a heady, pungent aroma. May through September. 30 in. x 40 in. This is a hybrid in Lavandula section stoechas. 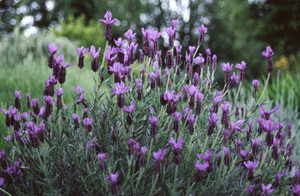 Lavenders need full sun and very good drainage. Because of our rainy winters, we amend our soil with 1/4 ten gravel and top dress with the same to keep plant stems and foliage from resting on wet soil.